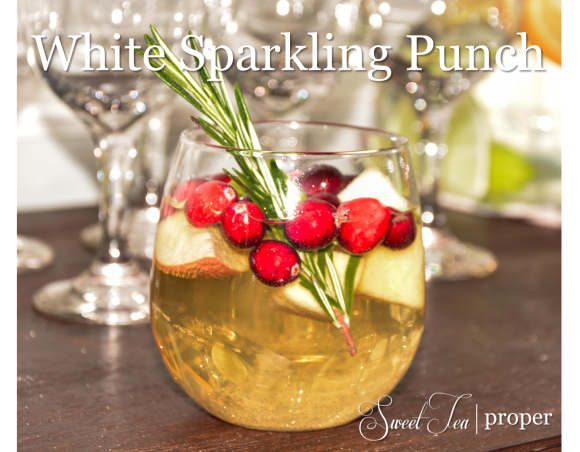 With just a few more days left of 2014, we are finishing up our holiday themed posts with a recipe for a delicious white sparkling punch. Served at our White Winter Wonderland Baby Shower, this non-alcoholic punch was both beautiful and super easy to make. It’s best served chilled so make sure to purchase the ingredients at least a day in advance. To add a little festivity to your beverage area, fill your drink dispenser and each cup with the apples, cranberries, and a sprig of rosemary. If you’re hosting your party outside of the months of November and December, don’t worry if you can’t find cranberries. This white punch can easily be incorporated for any party year-round by substituting the cranberries with another seasonal fruit. Chill grape juice, apple juice, and ginger ale the night before. Approximately 20 minutes before serving, blend the grape juice, apple juice, and ginger ale in a large clear container. Dice the apples. Place a few apple chunks in a serving bowl and pour the remainder in the punch. Place some cranberries in a serving bowl and pour the remainder in the punch. Cut the rosemary into small 3″ sprigs and place on a serving dish. *STP Tip: Dust the rosemary sprigs with “snow” by drizzling a little bit of water on the sprigs and rolling each one in a plate of sugar. To serve, fill each cup with ice and punch. Top with apples, cranberries, and a sprig of rosemary.